China’s increasing focus on exporting its values could ironically spell opportunity for foreign filmmakers. Read on to learn how and why. Back in 2008 the term “three afflictions” began appearing in the Chinese press to describe the major impediments that hampered China’s national strength during the past century. These were foreign aggression, poverty stemming from a weak economy, and the demonization of China by ‘hateful’ and ‘ignorant’ Western nations. As the press stories told it, the first affliction was conquered by Mao Zedong when he unified China under the Chinese Communist Party (CCP) and expelled the last of the foreign occupiers, the Japanese. The second was thrown off when Deng Xiaoping declared “to get rich is glorious” and engineered the great Chinese economic miracle that continues to the present day. With the first two afflictions licked, the CCP has now set its sights on tackling the third, which can be summed up as poor global public opinion. Government leaders are concerned that China’s negative image stands in the way of its international influence, and they’ve decided to do something about it. OK, enough history; what does all of this mean for filmmakers? For one thing, it means money. Lots of it. Hu and his colleagues in the CCP are anxious that Western culture and values have gone global in a way that Chinese culture and values have not, so they are investing billions in the effort to export China’s own value system, building the world’s most modern soundstages, production facilities, post production houses, animation houses, and the like. ‘Soft power’ and the cultural means to promote it have been elevated to the highest level of strategic importance. This is tantamount to a war of words and ideas with the West. But it takes more than artillery to win a war, it takes skilled personnel to operate the machinery. Winning minds takes the ability to generate creative ideas and the skills of persuasion, capabilities that the CCP sorely lacks. The post-1949 Communists have never before had to compete in the marketplace of ideas because in China they own and control the market. To compete on the global stage China will need skills that it hasn’t needed before. Skills like story development and screenwriting for international audiences. Sophistication in marketing, advertising and distribution to successfully circulate movies to the far-flung corners of the globe. Above all, the ability to understand what makes international filmgoers tick: why they go to see the movies they do and why they don’t go to see Chinese movies. These skills and capabilities aren’t going to magically appear inside China; they will almost certainly need to be imported. China’s top filmmakers—skilled directors like Zhang Yimou and Feng Xiaogang—have generated huge and loyal followings inside the country, but they do hardly any business outside. For instance, Feng’s recent Chinese blockbuster melodrama Aftershock, which racked up nearly $100 million in ticket sales in China, earned a paltry $62,962 from its release in the U.S.
More than either side realizes, China needs Hollywood. And for Hollywood’s legions of skilled but underemployed writers, directors, producers, rotoscopers, sound editors, marketers, distributors and other talents, this means money and opportunity. If you’re one of these talents, China has a shortage of your kind of expertise, and piles of cash to pay you for it. Will seizing these opportunities mean selling out your values and becoming a mouthpiece (喉舌) of the Communist Party? Hardly. The past decade’s two greatest examples of films that successfully promoted Chinese culture were made by outsiders pursuing their own self-interest. Crouching Tiger, Hidden Dragon, directed by Taiwan’s (!!!) Ang Lee, swept the world with beautiful and sensuous images of China, earning $200 million worldwide (nearly $300 million in 2011 dollars). And Dreamworks Animation’s Kung Fu Panda films have been highly praised by CCP members for their ability to entertain audiences both inside and outside China while remaining faithful to traditional Confucian values. The two Panda films have earned $1.3 billion in worldwide box office receipts, and Dreamworks’ Chairman Jeffrey Katzenberg is in talks to set up a $300 million joint venture to make films in China. Although Katzenberg and Lee have done a great deal of good for China, no one is accusing them of being Communist Party lackeys or sympathizers. Foreign filmmakers have an additional advantage over their Chinese counterparts: freedom. 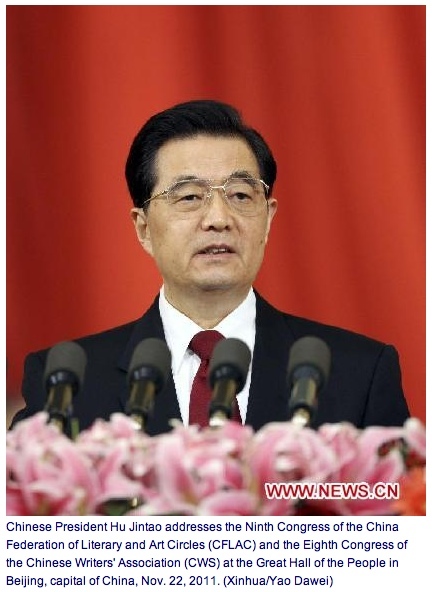 Remember Hu Jintao’s exhortation to “let flowers bloom and hundreds of schools contend”? His intent must have been to send a chilling reminder to the Chinese that their ideas and artistic contributions are welcome only so long as they toe the line of political correctness and espouse the party’s message. When Mao Zedong launched the original “100 Flowers” campaign in 1957, he encouraged uninhibited public discourse to uncover a variety of views and solutions to national policy issues. After six weeks of this ‘experiment’ with freedom of expression, Mao swiftly repressed or executed those whose views offended him. While Chinese artists must be extremely cautious to avoid a similar fate, the worst that can happen to foreign filmmakers is that their projects will be rejected by the censors. As David Bandurski put it in his recent New York Times article, “China’s ‘third affliction’ is a self-inflicted malady” that it cannot cure by diktat. “Governments in countries with cultural censorship may no longer fear criticism at the hands of their own country’s cultural work, but they must endure the ridicule of the whole world.” China’s best hope for improving its global image will be to enlist outsiders—storytelling mercenaries, or modern-day de Toquevilles, if you prefer—to shine a light on that nation’s best, brightest, and most universal values. If you’re a Hollywood filmmaker, there is no shame in telling stories that explore the wonders of China’s magnificent 5,000 year old culture. If you can make globally successful films while you’re at it, China and its leaders will thank you. This entry was posted in Analysis, Opinion and tagged Chinese Communist party, Crouching TIger Hidden Dragon, Feng Xiaogang, Hu Jintao, Kung Fu Panda, Rob Cain, Soft Power, Third Affliction, Zhang Yimou by chinafilmbiz. Bookmark the permalink. Adapting to the rules is what it takes it seems, and having someone who can get you at least to the door. Maybe the door will open , maybe not, but finding the first connection with a passable script is the first step. A Question Rob:..Does the SARFT just reject a script or do they give options for the script to be changed to before approval.? If anyone else has experience or knowledge about that I would love to know as I have a script set mainly in China. Russell, in my experience SARFT will offer suggestions for adjusting your script to accommodate their needs. As with anything, having good 关系 (“guanxi”, or “connections”) can be useful in getting help.